Girl is NOT a 4 Letter Word: Board Slides With Ryan Gosling. Board Slides With Ryan Gosling. Dime x Alltimers from Dime Mtl on Vimeo. 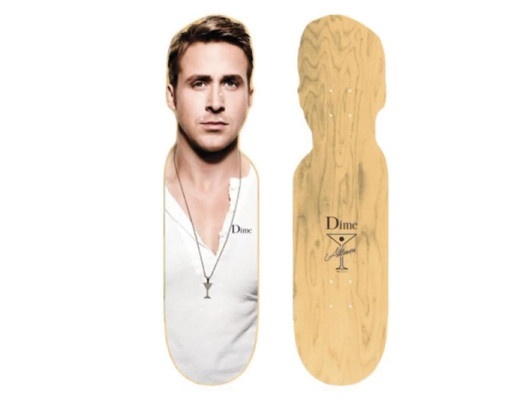 Just what every girl who skates has been waiting for... a board that looks like Ryan Gosling. In the world of skateboarding where women's faces & bodies grace many a board geared for the guys, is this board just fair play? Or is it more along the lines of just plain old ridiculous, and perhaps even sending a subtle message that we have heard before, "girls can't skate", with its odd shaped deck? Whatever it's meant to be about, we think the girls & women we know that skate, would prefer a deck that is actually functional. Meow, Silly Girl, OG Betty, Pink Helmet Posse, and Hoopla all make decks that fit the bill for pool, bowl & street. But if you can't wait to get your hands (or feet) on this deck, Alltimers x Dime is releasing this board on July 15 at 12:00 AM. I mean aren't guys missing out by not having a board shaped like Beyonce?